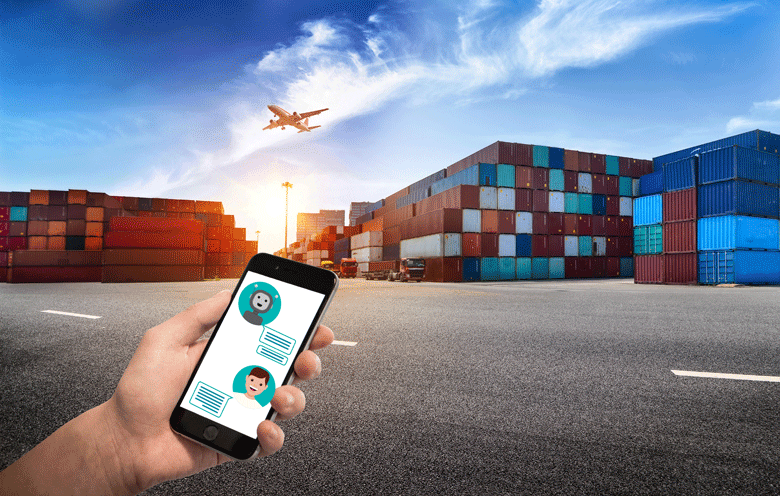 Share the post "How chatbots give your supply chain a competitive advantage"
Not long ago, supply chain meant “call and response.” We ask or request and then get a response. At its essence, the supply chain is still the same. It’s just that the efficiency and effectiveness have increased phenomenally nowadays in getting responses. With our money moving to blockchain, devices getting connected to the Internet, and conversational user interfaces changing our lives – many forward-looking businesses now turn their fineness in supply chain execution into a dominant source of competitive advantage, using chatbots. Yes, using chatbots! Here’s why. Every day, 2.5 exabytes (EB) of data are created. It means, by 2020, we will produce 44 zettabytes (ZB) of data (1 ZB = 1 trillion GB). This will keep expanding. Isn’t it? So, how this explosive growth of data is relevant to the increasing utilization of chatbots is the question of many ambitious businesses. Let’s dissect bots for that. Bots, essentially, are comprised of three elements: a channel (messaging platforms like Facebook Messenger, Skype, Slack, etc. or email and text), the ability to derive meaning (many bots utilize NLP to understand human language and machine learning to improve that understanding over time), and integration with the source of content (like ERP, ECM, CRM, databases, etc.) to assume what the end-user wants to get or do. Henceforth, for businesses, the combination of bots and enterprise systems holds a great potential as it unlocks huge value from data. On the other side, the consumer of today wants interactions with businesses “on his time,” using the channels and devices of his choice. So, in time, when people are utilizing chat as a primary interface, chatbots can become a potential source of productivity leap. In fact, in Q4 2016, only 21% of businesses were using chatbots to manage supply chain processes in a better manner. Nevertheless, by Q2 2017, it grew to 51% (according to EFT’s Hot Trends in Supply Chain 2017 Q2 report). If you have felt that your company has been on the treadmill of making supply chain a dominant source of competitive advantage, then this blog is for you. Here’re some of the “whys” behind increasing adoption of chatbots by companies to transform the way supply chain processes are handled. It was just a year back when BMW had to stop the production of its 3-Series sedan in Germany, China, and South Africa because of supply delays of steering gears from Bosch. I am sure there are many companies and customers who deal with supply delays. The worst thing about it is the unavailability of information until we send an email or call customer support. But, with a chatbot, one can get 24/7/365 shipping updates and make shipping delays history. 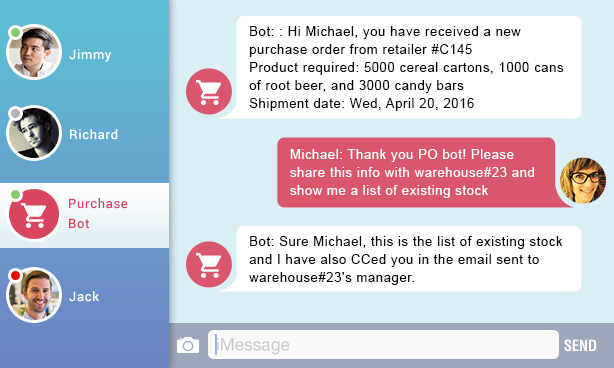 Since chatbots can retrieve the real-time information regarding the shipments and orders from the on-premises enterprise systems, the end-customer can request chatbot to provide a delivery status of the product, which he has ordered. In days when warehouse managers were required to have a keen eye over stock levels and order supplies manually on a telephone; excess inventory or items out of stock used to be a major problem. Nowadays, chatbots constructed with NLP algorithms and conversational interfaces are increasingly preferred by companies across the industries, to know product stocks or to request orders. Below is the image of a bot we had developed for a popular manufacturer to facilitate SCM. Imagine if you receive 88 emails per day. Won’t it be a headache? Sadly, that’s the truth of an average employee, according to the Email Statistics Report, 2015-2019, Radicati Group. With chatbots, any enterprise can save a significant amount of time while making internal communications. 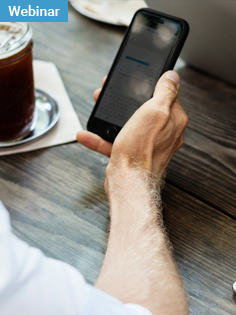 Be it the workforce task management, issue reporting, delivery of product or company FAQs, and distribution of technical documents or training materials internally – chatbots accelerate the internal communications effortlessly and boost productivity. Below is the example of an internal communication happening in a company with a chatbot. It is obvious that as the market demand of any product or service increases, companies have to work hard to optimize supply chain. 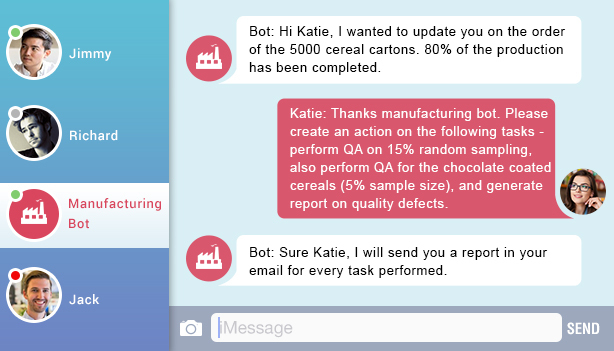 During such times, companies can request reports and analytics of any particular item from a specific vendor with precise timings, and can share with manufacturer/vendor/operation manager – all with the chatbot in a minute or less. Isn’t it a wonderful way to upgrade efficiency and speed of your supply chain processes? Labor-intensive operations, lack of a proper system to track inventory, superfluous inventory, human errors, and many more are some of the common demerits of a traditional inventory management system. Now with chatbots, mainly constructed employing AI and cognitive technology, one can give it the ability to fix a goal and work autonomously to achieve that goal. To build such AI chatbots, we give the bot an ability to sense, an ability to make a decision using machine learning with predictive analytics, and an ability to act. In all, we infuse intelligence into the chatbot as per the client’s requirements. Moreover, AI-powered chatbots will handle all paperwork, send orders, deal with invoices and payments – all without human intervention (No doubt, exceptions will be assigned to a human). Chatbots can also build a competitive list of suitable suppliers. In all, companies can free up their workforce to better leverage their knowledge for streamlining other valuable business processes. These are just a few reasons behind the increasing adoption of chatbots by companies to make their supply chain a potent source of competitive advantage. The possibilities are endless for what can be done with chatbots. To start with, how about knowing how BFSI industry (one of the most competitive industries today) employs smart chatbots to make their supply chain a dominant source of competitive advantage.